For this Super Easy Egg Keto Breakfast Muffins recipe, I only had to make a few adjustments. Take out the milk and the homemade biscuit dough. Oh, and I believe she may have had some sugah in there too. I think she added it to everything just because! You’ll find these Easy Egg keto breakfast muffins are super simple to put together especially if you are meal prepping! The only thing that’s at all time consuming is cooking the bacon, and you can do that ahead of time or if you don’t think it’s too much of a sin-cook it in the microwave! 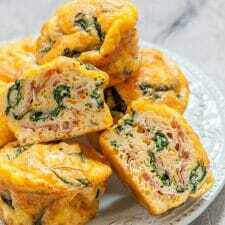 If you’re using frozen spinach make sure you thaw it & let it dry out or your eggs will be all watery & that’s no good! You can dry it fast by pressing it with a towel or paper towels to speed up that process if ya need to! Ok! I hope y’all enjoy this recipe! I bet if she were still around my grandmother would approve even though there’s no sugar in sight! Easy Keto Breakfast Muffins Recipe This easy low carb ketogenic breakfast recipe is perfect for busy mornings! 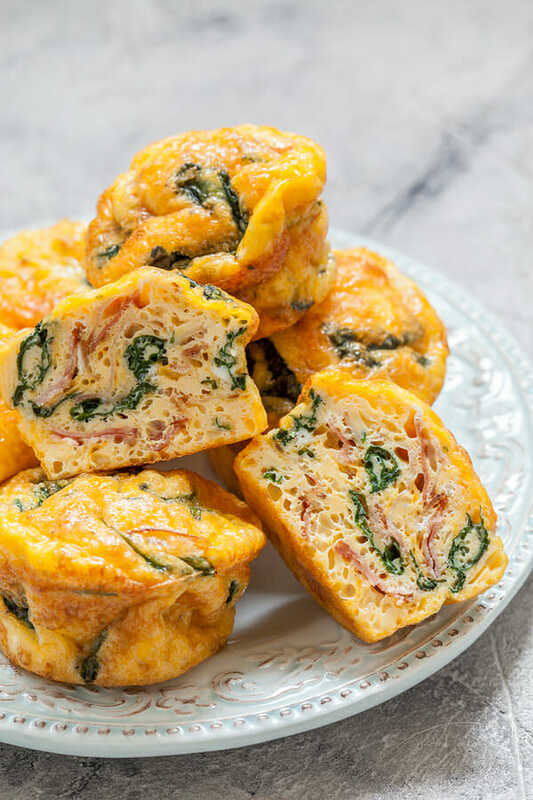 Make these egg muffins ahead of time for a delicious on the go keto breakfast or low carb high fat snack! Colorful, hearty, satisfying and super easy these low carb keto breakfast muffins are just what you need on busy mornings! Crisp bell peppers, onions, spinach, cheddar cheese, bacon, and fluffy eggs come together in minutes to create the perfect on the go breakfast or snack! Fry bacon & allow it to cool. Rinse the spinach & dice bell pepper & onion. Use the butter to grease a 12 cup muffin tin. If you’re using frozen spinach and its still soggy from defrosting, set it in a strainer in the sink & take a towel or (several) paper towels & press down to soak up any water remaining. This will keep your eggs from being runny! If you’re not in too much of a hurry you can beat the eggs for about two minutes. If you are late already, go ahead & start adding your ingredients. Just toss in the spinach, cheese, bell pepper, and whatever is left of the bacon. I know you ate some of it. Mix all of that up until you just can’t take it anymore & then it’s time to fill your muffin cups.